Matt Chamberlain has made his live debut with Soundgarden. The session great, whose credits include everyone from Elton John to Kanye West, joined the band on stage for their recent show in Lima, Peru. You can see Chamberlain in action with the band in the clip below. 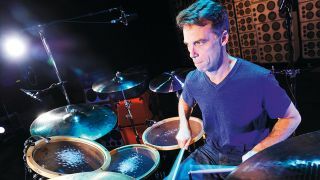 The move comes after Matt Cameron announced that he would be taking time away from Soundgarden in 2014 to concentrate on touring with Pearl Jam. Soundgarden fans will be able to see the band in action with Chamberlain at the kit when they hit Hyde Park for a special show on 4 July. The British Summer Time show will be headlined by Black Sabbath and the bill also features Faith No More, Motörhead and many more.